Inventoried as Route 070F, unsigned Business Spur I-70 in Eagle follows Eby Creek Road from the north side ramps with Interstate 70 (Exit 147) south to U.S. 6 (Grand Avenue). Four roundabouts line the 0.346 mile route. CDOT recorded 18,000 vehicles per day (vpd) on the route in 2015. 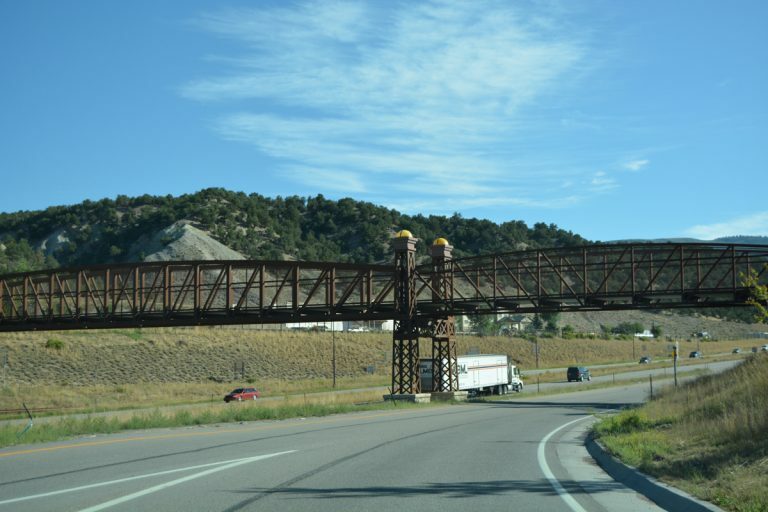 Pre-fabricated sections of the pedestrian bridge spanning Interstate 70 at Eagle were transported to the work site and assembled during a full closure of the freeway on September 10 and 11, 2014.2 Photo taken 08/11/16. Eby Creek Road heads north from the roundabout with U.S. 6 (Grand Avenue) and Church Road to span the Eagle River. Considered a major collector by CDOT, two lanes continue north to I-70. Photo taken 08/11/16. Motorists enter a roundabout with Chambers Avenue beyond the UP Railroad overpass. Photo taken 08/11/16. Businesses occupy all four quadrants of the Chambers Avenue roundabout. Photo taken 08/11/16. Business Spur I-70 (Eby Creek Road) continues north to Loren Lane and a roundabout with the south side ramps of Interstate 70. Photo taken 08/11/16. Painted shields accompany overhead signage on Eby Creek Road north for the eastbound ramp to Avon, Vail and Denver. Photo taken 08/11/16. A bypass lane allows motorists bound for Interstate 70 east to avoid the roundabout with the eastbound off-ramp for Eagle. Eby Creek Road sees additional roundabouts at I-70 west and Market Street. Photo taken 08/11/16. Drivers from Interstate 70 eastbound enter the Eagle Business Spur at a roundabout. Photo taken 08/11/16. Drivers heading south on Business Spur I-70 from Eby Creek Road and the north side ramps to I-70 enter a third successive roundabout at Chambers Avenue. Photo taken 08/11/16. Chambers Avenue leads west to a rest area and tourist information center serving travelers in both directions of Interstate 70. Photo taken 08/11/16. Fairgrounds Road extends west from Chambers Avenue and the nearby rest area to the Eagle County Fairgrounds and sports facilities. Photo taken 08/11/16. Eby Creek Road continues south from Chambers Avenue toward U.S. 6. Chambers Avenue spurs east to several traveler services and an industrial park. Photo taken 08/11/16. Business Spur I-70 (Eby Creek Road) sinks below a Union Pacific Railroad bridge ahead of Nogal Road east. Photo taken 08/11/16. A roundabout lies just beyond the Eagle River with U.S. 6 (Grand Avenue) and Church Street south. Photo taken 08/11/16. U.S. 6 (Grand Avenue) angles southwest to Broadway Street, which leads south to Downtown Eagle. Further west, Sylvan Lake Road heads south from Grand Avenue to suburban areas of south Eagle and Eagle Ranch Golf Course. Photo taken 08/11/16. "Eagle Interchange Project Moving Forward." Colorado Department of Transportation, news release. June 6, 2013. "Pedestrian Bridge to be installed over I-70 near Eagle this week." Colorado Department of Transportation, news release. September 8, 2014.